Paranaque City (January 19, 2018) - Wish 107.5, the No. 1 FM Station on Youtube, in cooperation with Stages and RankOne Productions proudly present Morissette's first major solo concert to be held on February 20, 2018 at the Smart Araneta Coliseum. Brief history on Morissette Amon, a Cebuana with big dreams, she competed in various singing competitions like TV5's Star Factor as a runner up and ABS-CBN's The Voice Philippines Season 1 and was chosen to join Sarah Geronimo's team. She made it into broadway in the Repertory Philippines production of Disney's Camp Rock where Coach Lea Salonga recalled her name during the The Voice PH blind audition. Her career got boosted when she did a cover of 'Secret Love Song' for Wishclusive that gained 50 plus million views and counting. It got her Gold Wishclusive Elite Circle from the recent event Wish Music Awards 2018. Now, give her a listen if you haven't. This song came after the viral song 'Secret Love Song', she thoughtfully came up with 'Rise Up' cover on reaching out. What would we expect from her upcoming concert? The audience will see an improved Morissette. She along with the production team will wow the crowd with impressive numbers. Of course, a concert wont be complete with surprise guest to keep the audience guessing. 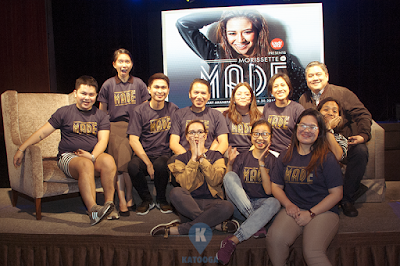 MADE is directed by Paolo Valenciano with Adonis Tabanda as the musical director. According to Paolo, "Morissette is one of those artists that just makes me so comfortable to go to work because I know she will deliver. We want to immerse her fans into the ultimate Morissette experience and we're all very excited!" The Dome is expected to be filled with 'Mowienatics', the official name for Morissette fans. To see her in concert tickets are available at www.smartaranetacoliseum.com and www.ticketnet.com.ph. The team is excited too.